Are you curious about the Bali Breeze stamp camp yet? 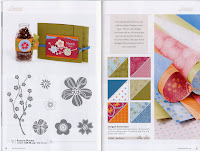 Pick up your new Summer Mini Catalogue from Stampin' Up! and turn to pages 8 and 9. Have a look at the Eastern Blooms stamp set - isn't it gorgeous and then cross over onto page 9 and have a look at the Bali Breeze Designer Serious Paper. The colours are so vivid and just wonderful. Can you even bear to put a pair of scissors near them?? I've been wondering what colours to use in our new house (the one that is in the middle of being built) and I think this colour selection might be just the answer. I always knew craft would be the next answer to interior design! This is what our new house looks like right now! Picture this with the colour accents I plan on using from the Bali Breeze Designer Series Paper. Cool huh?? ?